Stay at this stylish Universal Partner Hotel situated close to Universal Orlando Resort , SeaWorld and the Disney Theme Parks. Welcome to the Best Western Orlando Gateway Hotel, the Gateway to Orlando Attractions in Central Florida. This full-service hotel offers the best in customer service for both business and leisure travelers. Guests will be minutes from Universal Studios Florida , the Universals Island of Adventure theme park and Universals Volcano Bay water theme park, opening early summer 2017. Each well-appointed guest room and suite at this Orlando hotel features cable satellite television with HBO and free high-speed Internet access. Hotel guests will find great dining on-site at the hotel's restaurant or cocktail lounge. The hotel is also ideal for group travel with full-business services and meeting facilities, perfect for conferences, family reunions and other events. 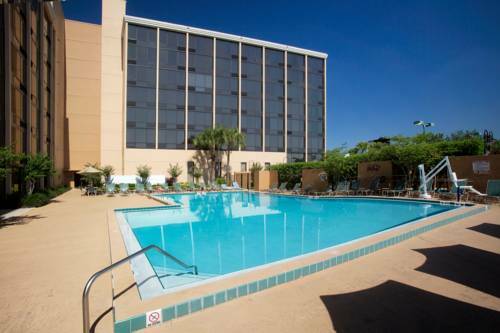 The Best Western Orlando Gateway Hotel also features a fitness center, guest laundry and a half basketball court. Guests staying at the Best Western Orlando Gateway Hotel will be less than ten miles from local attractions such as the Walt Disney Resort and Theme Parks, SeaWorld , Discovery Cove , Disney's the Wide World of Sports and Dr. Phillips Center for the Performing Arts. Corporate travelers staying at this Florida hotel will be close to the Orlando/Orange County Convention Center, Coleman Aerospace, L-3 Communications and Lockheed Martin Missiles and Fore Control. Hotel guests will also enjoy sky diving at the indoor Sky Venture, less than one mile away. The Best Western Orlando Gateway Hotel is proud to offer superior customer service and a convenient location in Orlando. Make a reservation today and save! Enjoy your stay. Shades Deli, on premises, deli, American, open for: breakfast, lunch, dinner, Royal Cup coffee, pastries, desserts, sandwiches, salads, pizza, sodas, beer, ice cream, candy, chips and more. Open 7:00 a.m. to midnight. 1 mile(s) from Fish Bones, full service, seafood, open for: dinner, seafood and steakhouse. Voted best in Orlando.